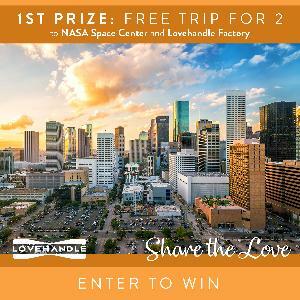 Prize: 1st prize ($2,500+): A trip to Houston to visit the Lovehandle Factory and the NASA Space Center including airfare (domestic flights only), airport transfers and hotel stay for 2! +more. Giving away $5,000+ in additional prizes! Statistics: This contest was opened by 207 and entered by 32 ContestChest.com members. 15% of those who opened the contest, entered it.